Monday sneaks up on me every.single.week. In the past week, I started in Phoenix, flew on a redeye to Newark in a nightmarish journey thanks to United, landed in Louisiana, spent a whirlwind amazing vacation in New Orleans, Baton Rouge, then another nightmarish journey (thanks to United) to Texas, then back home to Phoenix. Work, events, a concert, plans with friends and then...nothing. A whole weekend full of nothing. A belated Powder Room Fashionista post. Home/hotel/airport/starbucks...no mirror will go un-photographed! 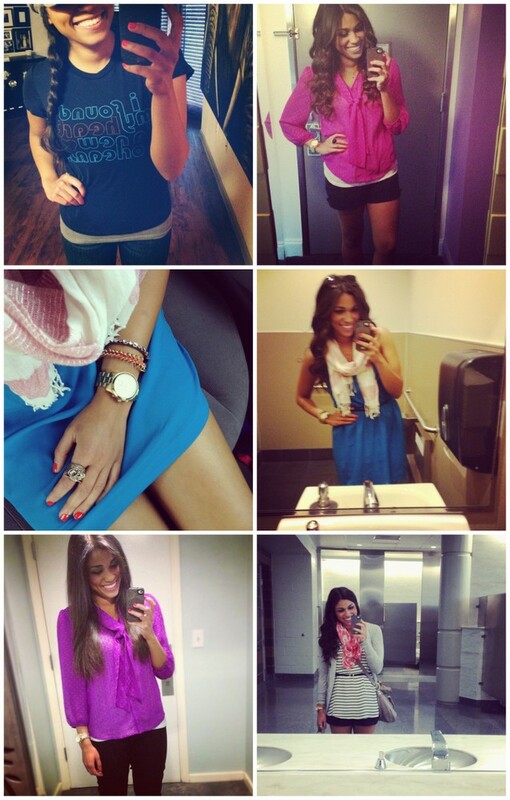 6 - top: forever 21 // sweater: forever 21 // shorts: old navy // scarf: ann taylor LOFT // belt: banana republic. You should start posting them:) If I could figure out the whole "link up" thing I would tell people too...much too blog high tech for me.